Last year we posted a "Publisher Q&A" series, featuring 12 short interviews with a range of publishers including Alec Soth, Shane Lavalette, Bryan Formhals, Jeffrey Ladd, and Jason Fulford on their presses and sites and the state of the publishing market (see the site links page for more links). It was a popular series, and we've decided to add another 12 entries to the series with more extended questions. The first three posts of this second series were with Éanna de Fréine of The Velvet Cell, David Schoerner of Hassla Books, and Luca Desienna of Gomma Magazine Ltd. Today we follow with Hannah Watson of Trolley Books. Hannah Watson joined Trolley in 2005, and along with Trolley's founder Gigi Giannuzzi ran their publishing and gallery activities until he passed away on Christmas Eve 2012. 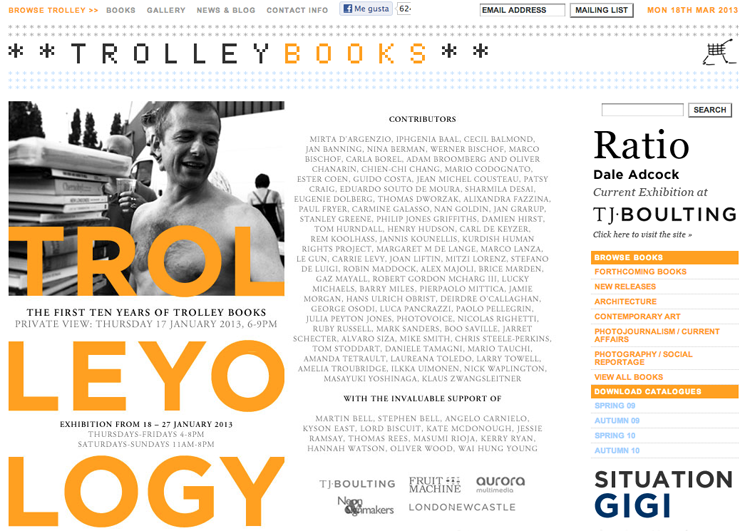 She now currently runs both Trolley Books and their gallery TJ Boulting in central London. Trolley Books is known for predominantly reportage photography titles, often focusing on underexposed issues, from conflicts to unique stories in photojournalism, as well as for contemporary art titles. Trolley has produced numerous respected and important books by photographers, among them Philip Jones Griffiths’s Agent Orange – Collateral Damage in Viet Nam, Paolo Pellegrin's Double Blind, Stanley Greene’s Open Wound, Adam Broomberg and Oliver Chanarin's Ghetto, and Alixandra Fazzina's A Million Shillings - Escape from Somalia. In 2005 Trolley Books received a special commendation from the Kraszna-Krausz Book Awards for its 'outstanding contribution to photography book publishing.' TJ Boulting's programme concentrates on presenting emerging artists and more established artists who have not shown in the UK before. Shortly before Giannuzzi died at the end of last year, work began on a new book now available, TROLLEYOLOGY, a look at the story behind Gigi and Trolley which also will mark their first decade in publishing. fototazo: What is the back-story on how Trolley Books formed? Was there a particular need in the industry that you saw and sought to fill? Hannah Watson: Trolley Books was founded in September 2001 by Gigi Giannuzzi. His first independent imprint, Westzone which he had started in 1997 with his first book by Nan Goldin, had not worked out after a few years, so he decided to start from scratch again, back to pushing a trolley around fairs instead of paying for stands and that's where the name came from. It was just after 9/11 and a time of global tumult, but it kind of said a lot about Gigi and his attitude towards publishing and also paved the way for how Trolley would carve its very particular niche into the photography and publishing worlds - never easy and always a fight against the odds. I don't think there was a particular gap in the market as it were, I think Gigi was never so calculated or business-minded in that sense - he was driven by passion for the story and fuelled by craziness. It's now looking back at how Trolley started that you see how he was doing something no one else was really doing, and working with photographers that no one else had seen the potential. Can you imagine now Stanley Greene without Open Wound or Adam Broomberg and Oliver Chanarin without Ghetto? f: What are the particular or unique strengths of the books Trolley Books publishes? What separates it from other publishers? HW: I would say it's the combination of powerful and important stories told by the best photographers in the world. The mix is diverse but the Trolley factor is a certain conviction as to why the book should exist. I think the beauty actually comes from seeing them all together side by side, that's when it really makes sense. HW: A lot of the books come about through just meeting the photographers or hearing about their projects, and then a shared sense that it should be a book. Philip Jones Griffiths described meeting Gigi as 'the closest he'd ever come to a religious conversion.' He'd spent a while trying to convince publishers that his work on Agent Orange in Vietnam should be a book and then he met Gigi who told him his book dummy wasn't good enough - it had to have more pictures in it! Philip was very important to Gigi and vice versa and it was a long term relationship until Philip died in 2008, working on his third book with Trolley, Recollections, right up until the end. HW: As publishing in general takes a knock, photobooks seem to be enjoying a sustained appeal and market. HW: Positive. Small runs and self-published books can sell out and receive wide critical acclaim while large publishers can carry on relying just on specialist bookstores and online distribution. iPad versions mean less financial risk so content can be experimented with and not compromised, also distribution is freed up so it should be a win win situation, however saying that I have yet to see an iPad version which made any impact compared to the printed book. f: Lots of people have commented over the past few years that we’re in a photobook Golden Age. Do you think this is true? If so, what are the dynamics that would define this as a Golden Age? HW: See above, yes it's good, hopefully we don't get too much of a good thing. Healthy competition, innovation, self-publishing - all keep people on their toes and push boundaries and keep it interesting. HW: The book as an object, the context of the story, the navigation, the quality of the image, the gravitas, the longevity. A book is a physical testimony, as well as a thing of beauty. Our books are predominantly based on stories, which should be read like any other book, that's why most of them are relatively small and intimately held in your hand. Multimedia is good for high impact. We actually started doing them first for our sales conferences as a way to make the reps wake up in the five minutes we were given to present to them. Blast them with images and music and hope they got the message of the book in a short space of time enough to go out and sell it! The books themselves by comparison are slow burn and don't go away. HW: Often the book is the product of a few years work so they know the material inside out and have an idea of the book in their heads, they enjoy working with us to edit and design in order to bring it all together. The book should be an extension of their voice and what they are trying to say otherwise it fails. Or they have nothing to say. HW: Maybe more conceptual books experimenting with the role of the book and/or photography? But Trolley is still driven by the story and the images and for us an original project will always stand out, it's what we are looking for. HW: I am entirely honoured and privileged to have known Gigi and worked with him and been a part of Trolley and the unique and special publisher he made it. f: What are the next steps for Trolley Books?